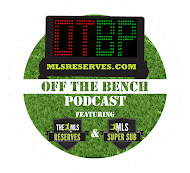 The MLS Reserves: Looking back at Zakuani and Mullan, a 2011 Moment of Significance. Looking back at Zakuani and Mullan, a 2011 Moment of Significance. There was a single moment of 2011 that has managed to stay in the back of my mind for months. It is a moment that few would care to remember but I believe it is one of importance. Early in the season there was an ill-fated tackle from a scrambling Brian Mullan that ended the season of Seatlle's Steve Zakuani. That sad moment has remained with me throughout the year and as I look back over the course of the year, I can safely say that some good did come of it. No one ever wants to see a player injured and in this particular instance, the injury was horrific. If you feel the need for context, take a look here. Now, what has come from this moment now almost nine months later? Several things. First and foremost we saw a very human side to the players involved. Mullan was seen in tears as he left the field and stadium, realizing the extent of what he'd done. We saw Mullan serve his ten game suspension with humility and take steps to rectify his mistake. Further more we saw fan bases flock to their players for support. Seattle fans rallied around Steve Zakuani to lend their words, well wishes and prayers for a safe and healthy return. Players rallied and the locker room grew closer. Literal blood, sweat and tears were shed in the land of Rave Green, only to see the team win an Open Cup, win in Mexico and graduate Kasey Keller to a legendary send off. The Zakuani injury caused ill of many, but it was a painful start to a fantastic journey for the Sounders in 2011. 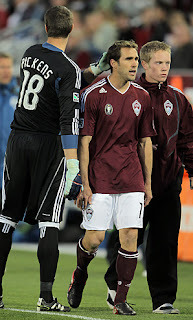 The league also took notice as the Zakuani injury was the start of a sad trend in early 2011. Star attacking players taking injury due to tackles. The league then made clear through suspensions and fines that reckless tackles would not be tolerated. Essentially, MLS realized that it had to protect its investments of attacking talent. That's a win for all involved. And what of Brian Mullan? Well he returned to the field after his suspension and fine were paid off only to show well. Mullan's year started off in horrific fashion, but that injury too helped him grow. His professionalism and willingness to allow his team to support him will see him add to an impressive list of accolades. Nearly a year out when we think of Brian Mullan do we think of the Zakuani tackle? Sure. But does it define Brian Mullan as a player? Not at all. As you head in to the new year and a new season arrives, keep in mind that greatness is forged through struggle and sacrifice. The trials faced may be daunting, but with hard work and determination, anything is possible. The year 2012 holds great things for Major League Soccer. Happy New Year. Brian Mullen on the other hand, initially did not come off as sincere as you make him out to be. In an interview after the tackel he stated that it was a tackel he has done all his career and that he would continue to do. Mullen will never get off easy in this town. If they let him play in Seattle in 2012 it I'm sure will feel more like one of our epic derby matches we against one of our Cascadia rivals. Sounders FC vs. Brian Mullen. kia tu vi kìm chế của Yêu Huyên cường hãn cho nên mới kìm chế được nhu cầu nguyên thủy nhất. Lúc này, Yêu Huyên đã không khống chế được mình nữa, nhu cầu nguyên thủy so với Nhạc Thành còn mãnh liệt hơn, kiều đồn không ngừng đáp lại Nhạc Thành, ngọc thủ quấn lấy cổ của hắn, trên khuôn mặt liền hiện ra một vẻ hồng hào. chém gió tục, thanh âm vô cùng vũ mị, đối với Nhạc Thành hiện tại mà nói, trong đầu hiện tại hắn cũng chỉ muốn phát tiết. I agree what the previous comment. I watched the game, and I didn't see Mullan crying as he was walking off the pitch. In fact, I remember him pulling a "Why me" shrug. Then in the interview after the game he didn't appear to think he did anything wrong. "I've done that tackle hundreds of times and would do it again" isn't something a person would say if they were crying as they were leaving the pitch right after breaking someones leg. Well, the league thought it was bad enough to give him red + and additionl 9 game suspension. The tears and remorse came when he saw the replays and realized the extent of what he'd done. And it WAS basically the type tackle he (and many other pros) have done a hundred times before. . . only it was too late. That's the line. And MLS's suspension was reacting to the outrage more than to the incident itself.